Ok, we are on to day two of the Health Activist Writer's Month Challenge. So far, so good. I think I can do this. Btw, it's GORGEOUS outside, which is why I'm just now getting this written. I love spring! Ok, Jess, focus! Today's prompt involved expanding my vocabulary: "Go to Dictionary.com and check out their their extensive archive and pick any 1-3 WOTD (one from your birthday, perhaps?) that you didn’t know beforehand and write inspired by the new word(s)" (WEGO Health Blog). Oh well, I'll just use dictionary.com. Today's word is unctuous (no, I'm not going to tell you what it means, that's what the link's for). While I could have made that word work, I decided to do some more exploring. I went to the archives and looks at some words from previous birthdays, and none really struck my fancy. Then I thought, why not look at my diaversary (my D diagnosis date)? Now dictionary.com did not exist back then, so I went back to the first year they were around and clicked on the word of the day for Friday, August 13th, 1999. Triskaidekaphobia. Huh? This would be a word I didn't know before. And what does it mean? "Fear or a phobia concerning the number 13" (dictionary.com). And now I am on the floor laughing so hard my stomach hurts! Why, you ask? Because this is PERFECT! It completely relates to my health condition. I was diagnosed with Type 1 Diabetes on Friday, August 13th, 1993. So, while I do not suffer from triskaidekaphobia, I have mixed feelings whenever a Friday the 13th rolls around, in any month. I am not superstitious or anything, but that date did turn my world upside down. It changed the course of my life. For good and bad. Triskaidekaphobia was the word of the day on dictionary.com on Friday, August 13th, 1999. This was my sixth diaversary. In 2010, my 17th diaversary was Friday, August 13th. This year, it'll be on a Saturday. I've never really celebrated my diaversary before. 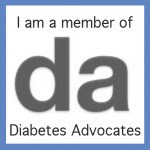 Since becoming part of the Diabetes Online Community, my perspective has changed some. Yes, the day is tinged with sadness. But there are also reasons to celebrate. I am still here, and am taking better care of myself now than I have in a long time. I love your word of the day too. I once had a flight scheduled on a Friday, the 13th, departing at 1300, seat? you guessed it. . row 13. I showed up to check in and the agent looked at my ticket. . paused. . sighed. . and said, "Hey, I'm not superstitious or anything, but this is REALLY weird. Can I change your seat or do SOMETHING to break this up?" Sure enough, when I got on the plane, NO ONE was in row 13. It's my best Friday the 13th story. Never knew that word but the 13th was when we bought our first house and our son (the one I was visiting) was born 8/13. So you made me smile. Sun is shining, snow is melting! I'm always a little bit wary of Friday the 13th's. Oh well, we all have our fears, right? P.S. Thanks for being nice to me on Twitter. Great job linking it to "D", and your approach to today's blog prompt! I am finding that reading the HAWMC posts by Team DOC is a pleasant side effect to this challenge. Keep up the good work! Hey there, I was Dx'd on a Friday the 13th too! June 13, 1980. Twins! ;) This is definitely a good year to recognize/acknowledge the Diaversary, even celebrate--YOU.